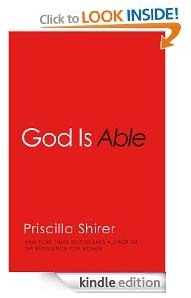 God is Able by Priscilla Shirer explains exactly why the author is on the New York Times Best-Selling List. Looking for a taste of the inspiration that the Holy Spirit has to offer? Look no further. She captures your attention from the beginning. Speaking directly to you, and to everyone like you. Those who have struggled to keep the power of God in the forefront of their minds. How creative this is, and it is only the beginning of the book. Wait until you hear of the miracles that continue in modern times! Through her voice, Priscilla Shirer guides you back into the realms of possibility that you perhaps once knew; the realms that we know are only possible through the great power of our Almighty Savior and the Holy Trinity. I abstracted one theme. This theme was successfully molded via Scripture, experience, story and hope and thus translated into one message for her audience: there is always hope where God is, and God is everywhere. There are many eBooks out there that are based on inspirational quotes, stories of miracles and hope for the future. But few are written so that you can feel the experience through the author and his or her eyes. Get this book now and find out exactly how happy I was to read this. God speaks through all of us. We are His vessels for spreading the Word, and it is up to us to listen to one who has a few words to share.